This luxury Mercedes Sprinter hire car screams sophistication on the outside and offers tons of space and efficiency on the inside. With available space for two passengers next to the chauffeur and nine passengers in the rear, you’ll never have to worry about a lack of space. Not to mention, this vehicle can hold up to eleven large suitcases — offering maximum efficiency for every passenger. The safety features ensure that you don’t have to worry about the ride ahead, but rather just worry about taking in the scenery. You’ll love the spacious row seating which gives everyone traveling with you ample leg room to stretch and relax. The dual-sliding doors make it easy to board all passengers, and the electronic close makes it effortless to lock in. Once you’re seated, it’ll be hard to get up from the comfort of your seat. The air filtration system and manual air conditioning will ensure that all your passengers are comfortable and refreshed at all times. 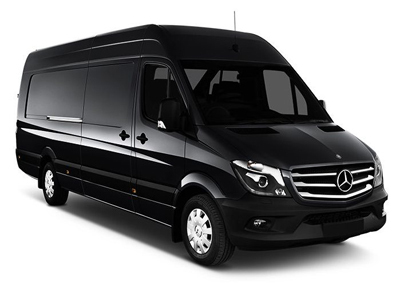 With our Mercedes Sprinter chauffeur service, you’ll never have to worry about the condition of your vehicle. Upon arrival, we’ll be sure to present you with a vehicle that meets our highest quality standards and a luxury vehicle that is something from a dream. Let our Mercedes Sprinter chauffeurs take you from A to B with our premium Mercedes Sprinter hire cars today.